The process of splitting up is painful for everyone involved. It marks a major turning point in the family’s life and has a strong effect on children. Talking honestly with your children can make the process easier for them to understand and deal with. Giving them the space to talk about their own feelings is also a huge advantage. Open and honest discussion makes the process less painful for everyone. Approximately forty percent of marriages in the UK and Europe end in divorce. The most common grounds for divorce are adultery, unreasonable behaviour or that the couple have been living apart for a number of years. Children are deeply affected by their parents divorcing. It can often affect their behaviour at home and at school. 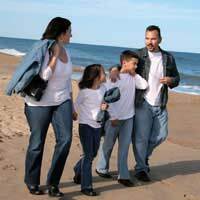 Many parents find it hard to maintain balance in their family relationships during the process. Taking the time to communicate openly as a family about what is happening will make the whole process easier to manage. The first thing to remember is not to underestimate your child’s ability to understand the issues. Children are sensitive and will usually be aware that something is going on, even if you have not talked about it with them. Set the tone by explaining to them that you and your partner are breaking up, and the reasons why. Secondly, you may find it helpful if both you and your partner sit down together with your kids for the conversation. If this is not possible, talk to your partner first to make sure you are sending a consistent message. Taking a united approach like this will be reassuring to your child. Consider your children’s age. If one of you has had an affair or there is a problem with abuse, you will not need to discuss all of these details with a young child. If they are older and aware of the issues, tell them openly. Common reasons for deciding to live apart are that the couple have grown distant, find it hard to live harmoniously together or that they do not feel the same amount of love for each other as they used to. Talk about the positives as well as the negatives in your relationship. If there is a chance you and your partner will get back together, let them know. If there isn’t, tell them. Your child may have a lot of questions for you to answer. Answer each one in turn and be honest. Ask them how they feel about it and be patient for a response. Initially, they may not want to talk. They might run away or shout at you. The important thing is, however they respond, to listen to them. Let them know you notice how they feel. Your divorce will bring up strong emotions in your child, which will take time to process. Don’t push them for a response, but do make sure you have the conversation. Children often think the divorce is in some way their fault. Explain that it isn’t. They might think they could have stopped it from happening by being better behaved. Or that they can save your relationship. Explain that the divorce is a result of your relationship with your partner, not your relationship with them. They may have feelings of guilt, worry and anger. They may feel protective towards one of you, or blame one of you. They might be relieved you are breaking up. Give them the space to talk about how they feel. Don’t tell them not to be sad. Sadness is a normal feeling to have under the circumstances. Often children will act out in order to draw your attention. Stay calm. Try to give them the chance to talk about how they feel. As a general principle, the more open you are, the more open they will be. Your child’s feelings related to the divorce will change over the coming months and years. New events may also cause old feelings to re-emerge. Be patient and realise the process takes time. Your divorce may mean that your child has to move house to live with one of you. This will mean a change of scenery, a new school, new friends. All of these issues should be discussed in as much detail as possible, giving your child the chance to talk about their opinions and feelings. Describe to them what options are open to them and what that will mean. Answer any questions they have. If you have a new partner you will probably want to introduce them. Be patient. Give your child time to adjust to there being a new individual in their life. It’s never easy to discuss divorce with your kids, no matter how old they are – it can hit teens even harder than younger kids. Be open, but always emphasise that both you and your soon-to-be ex will be there for them, and that you both love them. You really can’t say that often enough, both before and after the divorce.